Do Democrats Understand Political Independents? It seems like every time a party is defeated in an election, it blames that defeat on some group whose loyalties it once had but lost. Party strategists then talk endlessly about how to get this group “back.” Remember “values voters”? Does anyone think that the Democratic Party’s success in 2006-2008 came about because they successfully appealed to “values voters”? You’d think that after a few of these wild goose chases, people would start to learn. But no. The lesson of the 2010 election is, apparently, that the Democrats must get independents back. And this will necessitate some kind of bipartisanship or centrism or something, because independents have become more conservative. See, for example, Bill Galston. For one, many claims about the opinions of independents never separate leaners from pure independents. If there is a 15% drop in Obama approval among the entire mass of apparent “independents,” this could mean that there is a drop among independents who lean Republican, independents who lean Democratic, and/or pure independents. Why does this matter? Because the political consequences are different. If Obama loses 15 points among independents who lean Republican, he is losing voters who are unlikely to vote for him in 2012 anyway. But if he loses 15 points among independents who lean Democratic, then he has more serious problems. 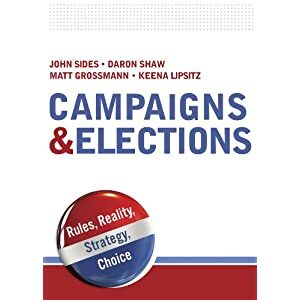 …Republican-leaning independents, just like ordinary Republicans, have become more conservative (also by 7 points) and…Republican-leaning independents are now a larger part of the independent pool (now 40 percent of independents compared to 30 percent in 2006). As political scientists have noted over and over again independents who lean toward the Republican party act very similar to Republican partisans (and Democratic leaning independents act like Democratic partisans), so this is a hugely important fact in understanding the changing political behavior of independents. Among the rest of the independent pool, there has either been no change in the number of conservatives (among non-leaning or pure independents) or a slight decrease (among Democratic leaning independents). So the increase in “conservatism” among independents is completely accounted for by the increased conservatism of Republican-leaning independents and the increased weight of Republican-leaning independents among independents as a whole. Ultimately, this entire post-election narrative is telling the Democrats to chase after a group of people who are functionally Republican. In 2008, 82% of Republican-leaning independents voted for John McCain. What is the White House going to do? …they think he must forge partnerships with Republicans on key issues and make noticeable progress on his oft-repeated campaign pledge to change the ways of Washington. Even more important, senior administration officials said, Obama will need to oversee tangible improvements in the economy. They cannot just keep arguing, as Democrats did during the recent campaign, that things would have been worse if not for administration policies. In other words, they plan to do one thing that won’t matter at all and one thing that will. Guess which is which! I’ll state this baldly: voters—independent or otherwise—do not put political process ahead of outcomes. Partnerships with the GOP might be nice if Obama wants to sign a few bills into law, but despite the lip service that voters pay to compromise, bipartisanship is far down their list of priorities. Here’s a counterfactual to ponder. What if Obama and the Democratic Congress had rammed through a $2 trillion stimulus, failing to garner a single GOP vote, but then the stimulus somehow reduced unemployment to 6%? Do you think independents would be offended by the lack of bipartisanship? 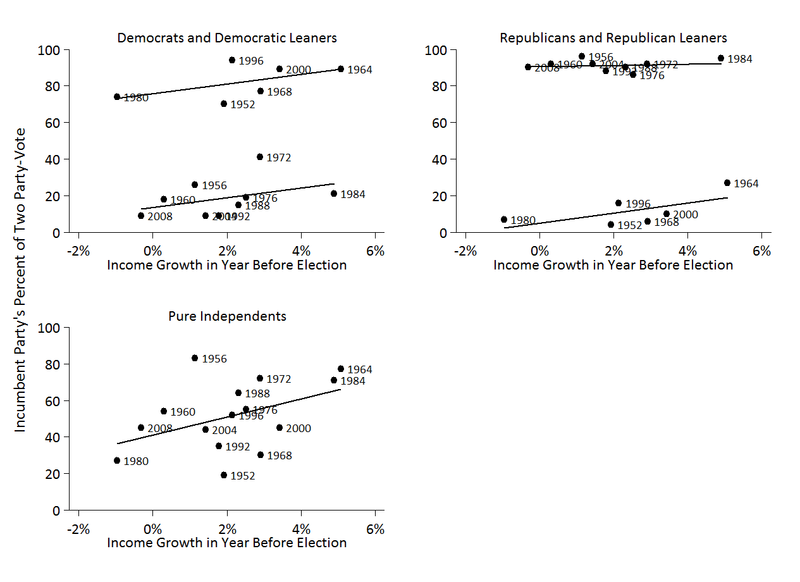 In fact, the relationship between the economy and elections it is stronger among independents than among partisans. Partisans are happy to vote for their party under most any circumstance and often rationalize their view of the economy accordingly. Consider the relationship between election-year economic growth and voting for the incumbent party’s presidential candidate, estimated separately for Democrats and Republicans, with leaners counted as partisans, as well as for pure independents. For partisans, there are basically two different worlds: when their party is the incumbent and when it is not. That’s why I present two separate lines in the plots for partisans. Within those worlds, the economy has only a mild impact—except among Republicans when their party is the incumbent, when the relationship is flat. By contrast, the relationship among pure independents is larger. The slope of that line is at least two times the size of the slope in any of the other graphs. To be sure, the economy is not the only factor that matters, but it does matter. Here is the bottom line. Voters don’t want style. They want results. Even independents. 17 Responses to Do Democrats Understand Political Independents? thanks for the post! Do you know of any published research that discusses economic voting for partisans vs. non-partisans along the lines of your graph? I am only familiar with Zaller’s “Floating Voters in U.S. Presidential Elections, 1948-2002” which presents a similar analysis for voters with different levels of political information. Funny, that’s what we were talking about in office hours 2-3 weeks ago! It’s ironic because the Obama administration didn’t want to pursue a stimulus package the size of the GDP output gap because a multi-trillion dollar plan sounded politically bad (tax and spend liberals), but because independents, especially, are going to be more reactive to the unemployment rate when it comes time to vote the smartest political move might ironically have been to push for the $2 trillion stimulus fund, and get that unemployment rate down. Rahm Emanuel talked about not wanting to waste a crisis, but isn’t that exactly what he did? Instead of Obama positioning himself to receive recognition for saving the country from a recession, Obama is now having to say ‘at least it was better than the republican plan.’ And, the small stimulus wasn’t even a productive decision in itself- the country’s economy lags with high unemployment, not much infrastructure improvement, no boom in green jobs, and the treasury doesn’t even get to recoup the a lot of the cost of the stimulus in increased tax revenue because our economy isn’t growing much. Also, is there a general tendency for incumbency rates to rise when the economy is doing well either nationally or by state/region?